Wall-mounted Console #5: Who pulled the plug? 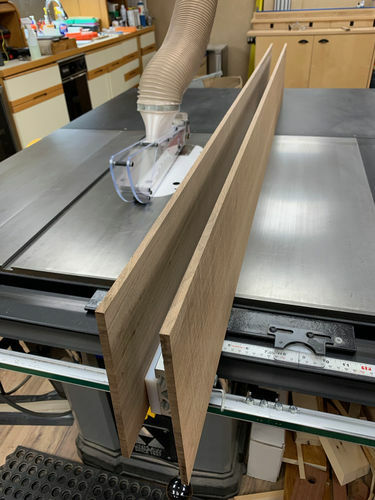 Before things went dark, I was able to resaw the panel I glued up for the back. Man I love my bandsaw. Set up a tall fence and halved the panel almost perfectly. Then I decided to install the Magports I purchased for my jointer/planer. Since the DC ports have to be switched when changing operations, this makes it much easier. They are really a neat idea. 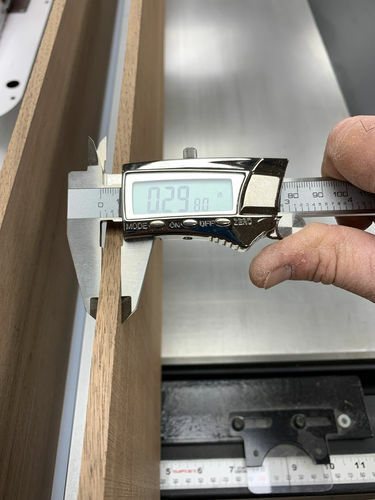 They’re well made and hold securely and were the perfect solution for this since I do not have the planer hard piped. 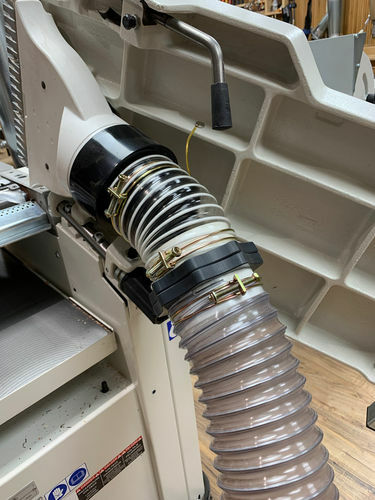 But even then, the DC hose needs to move from the jointer port to the planer port when required. I highly recommend these for anyone who has similar needs and I believe the inventory is a LJ. Now I’ll have to wait until power is restored to continue work. Hopefully that is sometime today. Oh my property didn’t come away unscathed. 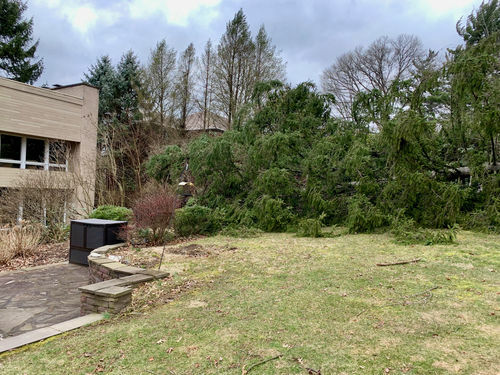 A 80’ – 90’ evergreen – not sure what species – came down between my house and the neighbors. Thankfully the prevailing winds were coming from the North and knocked it down and away from the houses. Bill, glad it missed the house. Trees have been falling in my area of Nor Cal quite a bit since the rains have started. Do you have a link for those mag ports, they’d work well for my two machines? Trees are down all over town here. I think we had 70mph winds and the ground was pretty soft due to snow followed by rain. Link to Magports. I really like these. I just ordered a blast gate and a few more ports. I want to use the ports on the Sharkguard. One for that and one to connect to my sled. I’m going to put a piece of plexiglass across the top and then mount the port to it. I use the sled a lot, but it’s a dust creator. These should help with that. That rootball is standing 10’ – 12’ tall or so. Oh and trees do make a sound even though you’re not there to see it fall lol Made the ground rumble too and my shop is on the other side of my property. So when the power went out, it did so at the same time I heard the tree go down. I thought it hit the utility pole service my house. The pole gray pole behind the tree in the second pic, is where my power comes from. The easement between the yards at the back of the property, has the power lines. Then my power hits that utility pole and heads underground to the house. However a few hundred feet down the utility easement, another tree when down from the same gust and took the wires with it. So when they fix that I get my power back. The rest is just cleanup. Pitt sounds like Roanoke this weekend Bill. 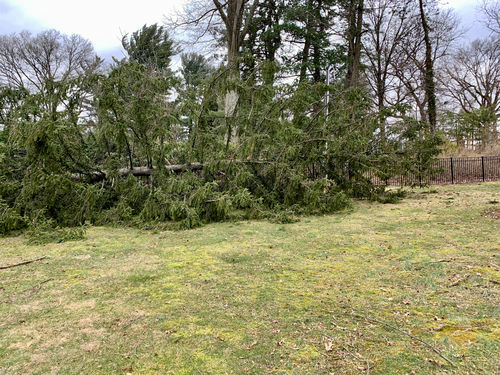 A week of rain last week then 60+ mph winds yesterday blew down tons of pines around here. I went road-hunting for downed trees yesterday to see if I could find some turning stock or fodder for my chainsaw mill. Nope. All pine. And my power went out for only the second time in 7 years yesterday too. They have an ETA of 4pm to have it back on today. Hopefully yours is forthcoming too! Thanks Bill. His starter kit is just what I need. Good to hear no one suffered damage from the tree falling. 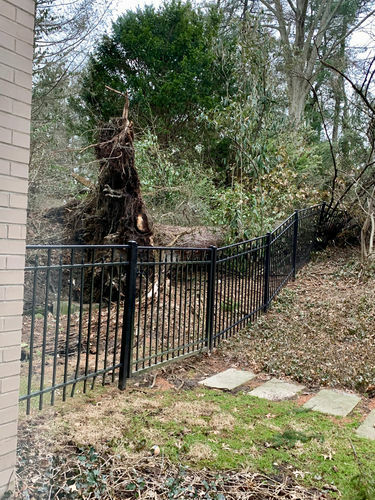 We’ve been really fortunate that the only thing that came down around our place was the top 25 ft or so of a tree outside the fence during the the last ice storm. Nothing look like it fell during the 50 mph wind yesterday. I had to look up the magport. Clever idea. If you have time, write up a review for them. Those resawed boards look good too. 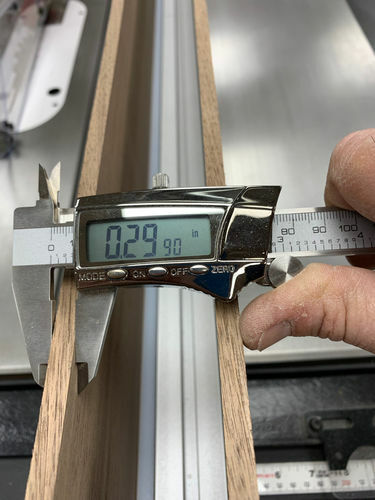 How big is your bandsaw? wow close call on that bill good thing the winds were blowing in your favoror you might have had more than the power out.i gotta check out those mag ports sounds like a great what to make connections,id never heard of them.nice resawing also,cant get much better than that. Yeah the video isn’t really good guerrilla marketing lol I thought about making them but it really wasn’t worth the effort. Here are ready to go and really well put together. Not sure if I’ll have power back today. Getting cold in the house so I’ve been out cleaning up all of the mess. That tree is being dealt with professionally. I’m not messing with it. YW :) That’s what I picked up first. Good to hear no one suffered damage from the tree falling. We ve been really fortunate that the only thing that came down around our place was the top 25 ft or so of a tree outside the fence during the the last ice storm. Nothing look like it fell during the 50 mph wind yesterday. Earl I have a Hammer n4400. It’s a 17” with a 3.5hp motor. Recently I installed their new ceramic guid system. Easy adjustability and the power makes for easy work. Larry it fell away from the house and straight down the property line, missing my neighbors shed, but unfortunately crushing my fence. Better that than one or even both of the houses. Is that a little white Mini Cooper I see in the background Bill? 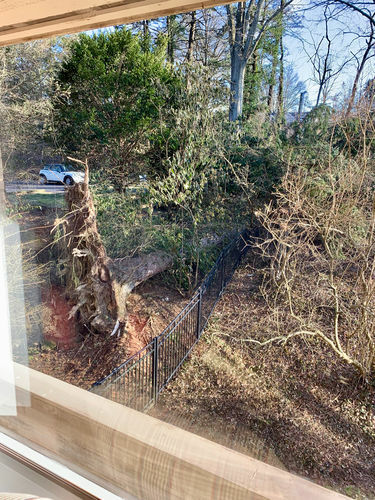 If so, the tree should have fallen on it. I would probably cut another tree down and direct it towards that car then blame it on residual winds and advise the owner to buy a grown up car. Unless that’s your car. Then I’m just kidding. Maybe. Unless that s your car. Then I m just kidding. Maybe. my brother in law is a mini cooper mechanic and would totally agree with you,he says there a piece of junk-LOL. Still no power here either Bill. I have stubbornly refused to buy a generator since we so very rarely loose power. I’m rethinking that now. If we have to go another cold night with no power, my wife may trade me in for one! Well mine is just powering a few lights, the charger for my cell phone and laptop and actually my desktop computer. I’m considering a whole house system. Not sure on natural gas or solar. Well I already priced solar from Tesla and they’re out of their minds, but I’ll see what other options there are in that area. I know around here there are big incentives to install solar. Those are from local governments though so not sure how common that is. It’s not even in all of the localities around here. Is it common to loose power at your place? You said the power comes yo a utility pole on your property so I guess it might be an issue if there are a lot of elevated lines.